One of my favorite colors! Love the graphic designs in the Tibi top and the Sorrelli earrings are to die for! LOVE the Sorrelli earrings as well. I also like the Kate Spade saddle bag-its the perfect size and shape for daytime errands, and I obviously love the colour. It is a good color, but I often feel if done wrong it can come off looking cheap! Of course that doesn't apply here … loving that scarf! 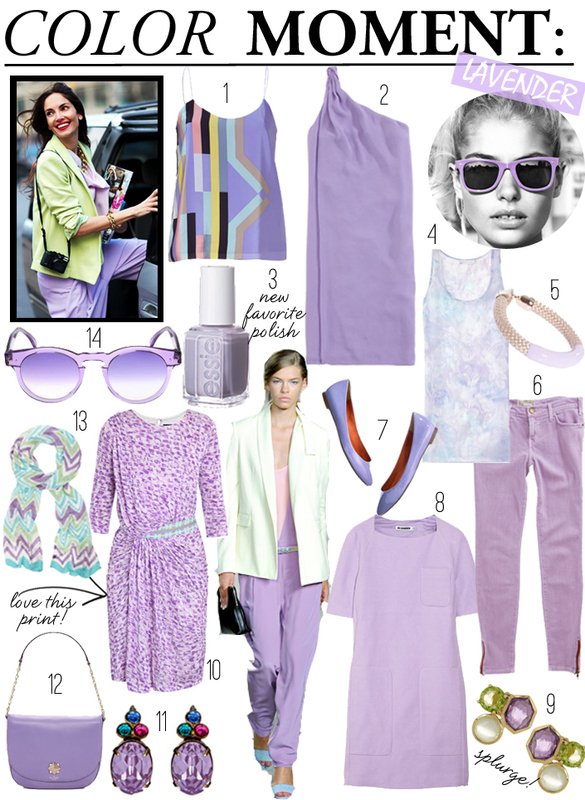 I love lavender – you've made some great picks here! Essie's 'To Buy Or Not To Buy' is the next polish I'm going to be painting my nails with! Love the lavender jeans and the DVF one shoulder dress. Lavender has to be one of my favorite colors! totally got essie “to buy or not to buy” on my nail this weekend – it's a great pale lavender and i am obsessed with it! I love Lavender! Great post and great pics. I've been obsessing over that Tibi print for months now – must break down and buy it soon! those sweet little sidewalk skimmers are just the cutest things around. love them. Such a pretty hue…… especially love the jewelry. I've been dreaming of a lavender room in my house. I doubt the husband will go for it! Love this lilac color, those sunglasses are gorgeous.